A group of ladies in traditional black, pictured in an old Turkish street of Thessaloniki in 1902. The sleeve predicts a folk music mashup, but in this respect the visual appearance is deceptive. “ΑΚΡΟΠΟΛΕΩΣ” is a truly appealing platter of acid house in Greek style conceived by Anopolis, a producer collective from Thessaloniki. 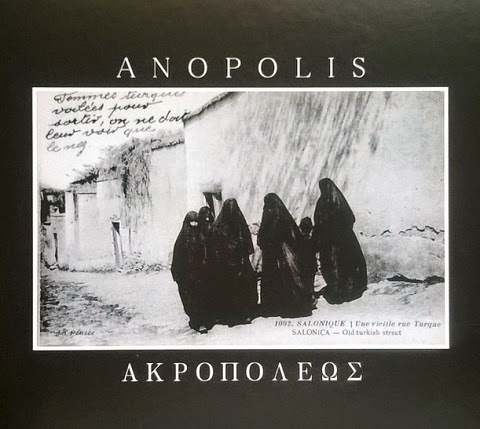 So the Athens-based label Lower Parts has published four variations on the theme Anopolis, pressed in white wax. The opener “Anopolis 2” differs from the rest, as it is synth-soaked electro disco I am tempted to compare with Rude 66’s recent jams on Bordello A Parigi. Biting acid funk in “Anopolis 5” recalls the glorious days of 303 Nation, less the 303, while the B-side gets seriously caustic. First The Minister & Manager 111 aka Andreas Gehm, here operating under the Elec PT.1 alias, disintegrates the opener to a massively bubbling and slapping tune and “Anopolis 11” is the most hazardous of the bunch with callous bass line and noisy effects. An energising effort by the Anopolis guys DimDJ, Drum Machinee, Lowjac and Oldman Talkin’. Whereas they are not jealous to disclose the applied hardware, e.g. TR505, TR707, ESX1, and the sleeve design is great too.